Home » Diet » 5 Top ‘Free From’ Products from the Speciality Fine Food Fair! 5 Top ‘Free From’ Products from the Speciality Fine Food Fair! London’s Speciality Fine Food Fair is an amazing place to seek out the latest health food brands that are soon to hit our stores. Just in case you missed it back in September, we thought we’d share a few of the gems we sampled and researched and stood out as we sought out some of the best ‘free from’ and healthier food options at the event. 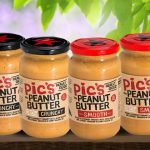 You should definitely know about these, so let’s get into 5 Top ‘Free From’ Products from the Speciality Fine Food Fair! If you are looking for a healthy snack for on the go, then this is the brand for you. This new UK based company create super tasty snacks packed full of vitality and all natural ingredients to help fuel your body and satisfy your taste buds. These snacks are all dairy free, gluten free and refined sugar free with no nasty additives.Their products include beetroot squares, spinach and coconut squares and my favourite, raw berry – cacao sandwiches. Look out for this new brand of healthy snack food! By now we have all heard about the incredible health benefits of coconut, in particular coconut oil. This company caught our eye because they use only ethically sourced coconuts in all of their products. They work directly with farmers to ensure they are using the tastiest coconuts, so there is no need for artificial flavours or preservatives. 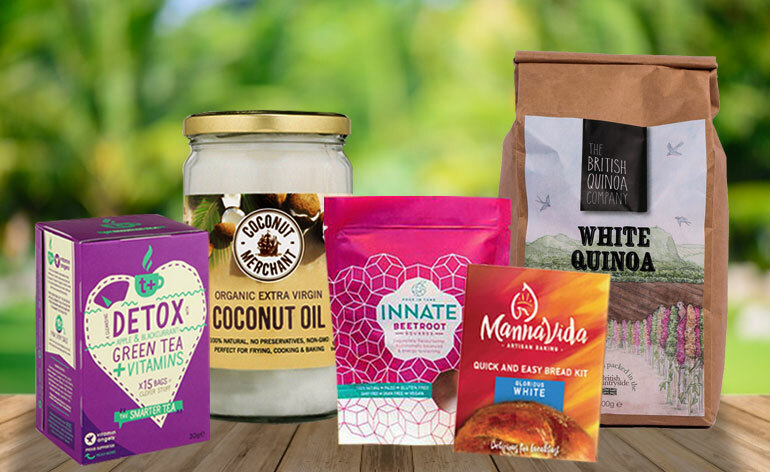 Coconut merchant have created a vast number of products ranging from coconut oil and water to the more exciting products of coconut chips and a delicious coconut jam. I was lucky enough to sample some of their products and can definitely vouch for their fresh tastiness. Quinoa is a super nutritious protein food and what’s great about this company is that they are growing it in the UK. Quinoa is a seed and recognised as a superfood because it is packed full of amino acids and minerals. This company are providing us with home grown quinoa based products like cereals and dried quinoa so we can benefit from the superfood properties of British grown quinoa. These guys are producing what they call ‘super teas’ and as an herbal tea fanatic, I can say they really are superb. T Plus are using hand-picked Sri Lankan green tea and adding herbs and vitamins to create flavourful, healthy teas. They have a range of teas including immunitea, detox, boost and multea. T plus are also giving something back. With every box of tea sold a small donation goes to Vitamin Angels, a charity dedicated to getting vitamins and essential nutrition to at risk children and new mothers. Another hearty reason to pour yourself a cuppa. As a coeliac (unable to eat gluten), I was very excited to meet this incredible artisan gluten-free baking company. They are producing some of the finest gluten free bread I have ever tasted and I have tried a lot! The best bit about their breads is that not only are they free from gluten, they are also free from additives and have the added bonus of being filled with healthy nutrients, antioxidants and fibre. The bread tastes like real artisan baked bread and whether sensitive to gluten or not, we highly recommend their products. We hope you find our mini selection useful and get a chance to find out more and of course try these newest, healthy free from, Speciality Fine Food Fair finds for yourself. Let us know what you think of them if you do!